Over the past year or so I have been listing 5 of this or 3 of that. From 5 signs that your tea time is morphing into something along this particular line or that to 3 reasons for doing something a certain way. It seems a convenient way to highlight the highlights, the salient points, as it were. Now, it’s time to talk tea balls, or rather the 5 reasons you might want to consider ditching yours. The scenario: “Time for tea. Where’s the tea ball? Oh darn, it’s still dirty from the last steeping and the leaves are still in it and dry on the outside with a disturbingly musty moldy odor coming from the inside. Sigh!” That’s if you’re the type who doesn’t clean up right away (see number 3 below). 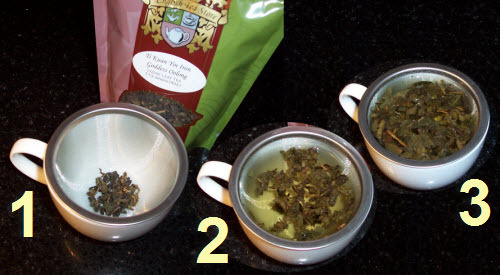 Basically, you need to locate the right size of tea ball (see number 4 below), fill it with loose tea, close it securely, and let the ball part sink into the water but being careful to attach the chain to the side of the teapot/cup/mug in which you’re steeping. Just thinking about it makes me want to shrug and have a cup of warm water instead. Test after test in my kitchen has shown inferior steeping from tea leaves when they are crammed inside a tea ball. The specific teas you are steeping will make a big difference in your success rate. 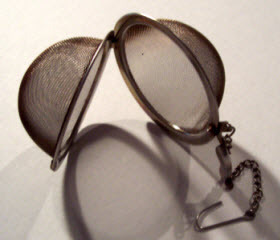 (See the follow up article on this topic: 7 Tea Types That Steep Poorly in a Tea Ball) Also, tea balls range from fine mesh ones to metal ones with big holes drilled in them, so of course the tea issue you have with one style may not be the case with the other style. 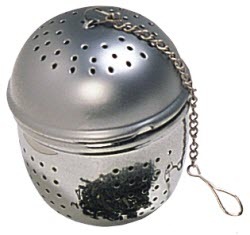 Finally, tea balls have been known to come open during steeping or when you go to remove them from the water, especially if you jerk the tea ball out too fast, and sometimes the chain secured to the side of the teapot/cup/mug comes loose and falls into the vessel so now you need a spoon to get the tea ball out. Sigh! The tea ball will drip everywhere, and you can’t squeeze it like you can squeeze a tea bag to get out the excess moisture. (We would keep a small bowl nearby to drop the tea ball in when pulling it out of the teapot. Even so, a spattering of drops landed on the teapot, cozy, and counter.) 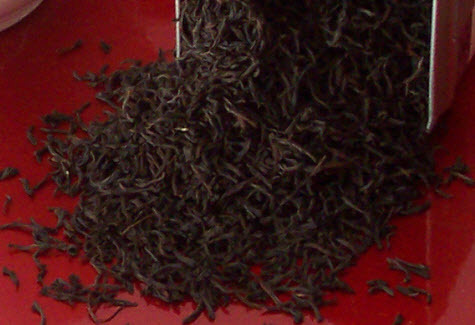 Then the tea leaf pieces need to be dumped out and the tea ball thoroughly rinsed. In fairness, we have to wash our strainer, so it’s pretty even-steven there. However, the tea ball can be a bit trickier to handle since there are two parts (some are hinged together, making things a bit awkward, and others aren’t so you have to be careful not to lose one of the parts). As stated in number 1 above, the first step in tea preparation for you tea ball users is locating the tea ball (and hoping it’s clean from the last use). You may even need several tea balls — one for the fannings teas, one for the broken leaf teas, etc., and in different sizes for the quantity of tea you are steeping. You could end up with a whole drawer in your kitchen devoted just to your collection of tea balls. Do you have an extra drawer in your kitchen? If so, great, you have a place to store those tea balls. My kitchen drawers are full of things like spatulas, basters, pizza cutters, cookie cutters, and most importantly my collection of tea towels. No room for tea balls! Tea is very individual, so I would never deign to issue such a command. However, if the voice of experience has any merit here, my strong recommendation should carry at least a little bit of weight here. No? Oh well, I try! Of course, you can always resort to things like T-sacs and drawstring tea filters. Whichever way you steep it, enjoy your tea! I find them useful to carry with some loose tea for an emergency. But otherwise, loose and free every time. A footnote: I have 30+ infusers as I buy novelty ones all the time. And never use them.